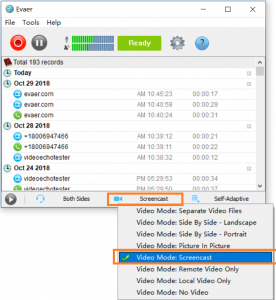 We have added new feature – Skype Screencast video recording mode at the most recent Evaer for Skype version. The new feature can record everything which you are doing on Skype. Such as video, chat message and voice. You just need to click the “Start recording” button to start the Skype Screencast recording with/without a Skype call. If you don’t want to use the Screencast mode to record your Skype, the below Skype video recording mode also supported with latest Skype 8.34. 2, Side by side – Landscape. 3, Side by side – Portrait. 5, Remote Skype video only. 6, Local Skype video only. This entry was posted in Skype Video Recorder and tagged Skype Recorder, Skype Screencast on November 14, 2018 by admin.